The second-degree murder retrial of Dennis Oland resumes Friday. Dennis Oland murder trial day #21 . Likely to be a short day. In the witness box is SJ Police forensic specialist Sgt. Mark Smith for a few remaining questions from defence lawyer Michael Lacy. The Crown can ask further questions arising from issues raised by the defence over the last two days but typically that is not extensive. No further witnesses are scheduled today. Lacy begins by revisiting Smith discovering Inspector Glen McCloskey and Sgt. Greg Smith deep inside the office in day #1 of the investigation and why that discovery was not mentioned in Smith’s notes. Lacy pressing Smith on how the defence would ever know that happened at the crime scene. Smith said yesterday he intended to testify to the incident once the trial occurred. But you testified at the preliminary inquiry and never mentioned this incident. That’s right. Why not? It didn’t come up. But you did testify about other officers being inside the office. Yes. Why not these two? I wasn’t asked about it. And you didn’t raise it in your testimony in the first trial either? No. I thought it would be asked about but it wasn’t. Lacy pointed out yesterday that Smith never mentioned the incident in any of his notes or in his detailed reports. Lacy says Smith testified yesterday he didn't mention it because he knew he was going to testify and believed it would come up then. You said you weren’t trying to keep this from anyone - that it was going to come out in your testimony? he asks. Yes, says Smith. Tough moment for Smith - and police. He’s acknowledging he knew about something important in the case and kept quiet about it. Full disclosure of relevant facts to an accused is required. You were asked questions at the preliminary inquiry about people being at the scene? asks Lacy. Smith says he was asked about a specific time period and had testified "not at that time." You said yesterday you were not waiting for right question to be asked, argues Lacy. I misspoke, says Smith. Lawyers fighting over next set of questions to Smith. Justice Morrison recesses court to consider what he will allow. Lacy is asking Smith about being interviewed by Halifax police, who conducted a criminal investigation into retired S/Sgt. Mike King's allegation during Oland's 1st trial that McCloskey had encouraged him not to reveal to the court that McCloskey had been in the office. Lacy says Smith told Halifax police he was "just waiting for the hammer to drop." Smith tells the court he was concerned about the matter, but the defence never asked the question and had moved on in their questioning. 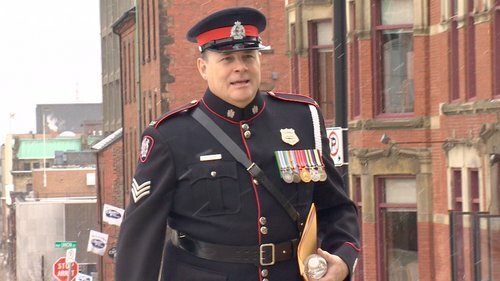 The defence in Oland’s first trial focussed a lot on sloppy police work but this trial is layering accusations on top of that of a coverup, or at least a conspiracy of silence, by both crown and police to hide some of that sloppiness. Lacy suggests if he was concerned, he could have raised it during redirect by the Crown. Suggests Smith was trying to keep the information from the defence when full disclosure is required. Last week Sgt. Oram - who told a story of wandering through the crime scene with McCloskey in a way even Smith said was appalling - testified he expected to be called as a witness by the crown in the preliminary hearing and first trial but never was for reasons never explained. Halifax police investigation into McCloskey did not result in any charges. NB Police Commission conducted a professional conduct investigation and McCloskey was scheduled to face an arbitration hearing, but he retired and the matter was dropped. It really wasn’t until midway through the first trial when Staff Sgt. King made explosive allegations of McCloskey trying to hide his incursions into the office (denied by him) that the whole episode began to reveal itself. Presumably that is not how an accused is supposed to be informed of an event that might be of interest to his/her defence. Even with King’s testimony in trial #1 and McCloskey’s own testimony to respond to it, the first trial only heard a fraction of what has emerged since. Smith agreed under cross-examination yesterday that it was "very possible" important evidence could have been comprised by McCloskey and Oram's movements within the office and proximity to the body. Court resumes although Justice Morrison is asking for more information and arguments on the next set of questions. The defence wants to ask Smith about how police expectations about how much blood Richard Oland’s killer would have on them changed after no blood was found in Oland’s car. The problem the court is having is that the expectation of a lot of blood is outlined in search warrants not written by Smith. He assisted in their construction and the court is trying to decide if, according to legal rules, he can be questioned about them not being the author. 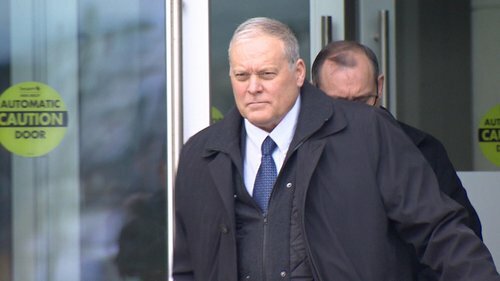 The defence wants to show after blood that was expected to be found in Oland’s car did not appear - it caused police to change their opinion on whether blood should have been found, not their opinion on whether Oland was the killer. Lacy goes through the warrant police obtained to search Oland’s home and asks Smith about sections he is quoted in. Those show Smith expected police would find blood evidence. "Smith further advised me...that if a suspect vehicle is located and seized by the police the forensic examination specialist with expertise will examine the vehicle for trace or latent blood staining," wrote Humphrey. Lacy asks Smith if he reviewed Humphrey's affidavit before the search warrant application was submitted to a judge for approval. Yes, says Smith. You knew it had to be accurate? Yes. Justice Morrrison finds no problem with Smith being asked about his role in the construction of the warrant and his opinion at the time blood would likely have been deposited by Oland in his car and elsewhere. Lacy concludes his extensive questioning of Smith which began Wednesday afternoon. Court takes a break prior to the crown asking follow up questions. The defence contends this application shows police expected the killer to have a significant amount of blood on their clothing and in their car. They argue the bloodstains found on the brown sports jacket Oland was wearing the night he visited his father are minuscule and the court has heard no forensic evidence linking him to the crime was found in the car he drove to and from his father's office. Lacy has no more questions for Smith. Court takes morning recess before lead Crown prosecutor P.J. Veniot has an opportunity to ask Smith some more questions on redirect. Smith asks lawyers - "I don’’t get a chance to add to what was asked of me then?" "See, when you want to clarify something, you don’t get a chance," he says to reporters, storming out of the courtroom. Crown prosecuter PJ Veniot begins by asking if Smith wants to clarify anything about the McCloskey/Oram incident. Oland retrial is back in session. Veniot says to Smith: "I believe that you want to make a clarification," regarding defence lawyer's Lacy's cross-examination regarding McCloskey and Oram being in the scene? Yes, says Smith. It was ever any intention of mine to mislead the court - this court or the first trial or the preliminary inquiry, says Smith. 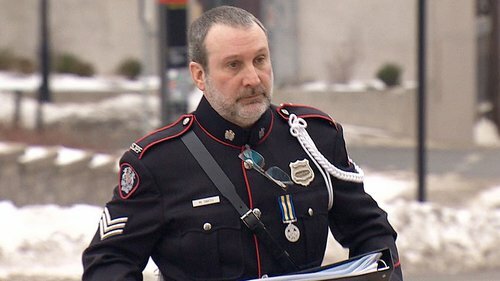 Smith says he was always prepared to disclose the incident and had discussions about it with the two officers and the crown but it simply never came up. Veniot has no other questions. Smith is dismissed. Court adjourns for the day. My thought was that either the Crown or the defence during their strategy as they saw fit would bring that up when they asked questions, says Smith. "I admit to making mistakes at the crime scene, but I’m not a liar." Dennis #Oland retrial is adjourned until Tuesday at 9:30 a.m.